Subscribe to the Orange Line Project Update to get news delivered to your inbox! Sign up now to receive Orange Line updates by email. I-35W Construction: Ride it out with us! 11/28/18 - METRO Orange Line receives full federal funding! The Orange Line's I-35W & Lake Street Station and the 12th Street Transit Ramp are now under construction are part of MnDOT's four-year 35W@94: Downtown to Crosstown project. Learn about transit options during construction, including added service, bus detours, and park and ride information. Sign up for rider alerts for updated bus detours and stop closures. Find more information on road detours and sign-up for construction bulletins on MnDOT's project website. To provide feedback or ask questions about construction, please call the MnDOT project hotline at 612-284-6125 or email info@35w94.com. 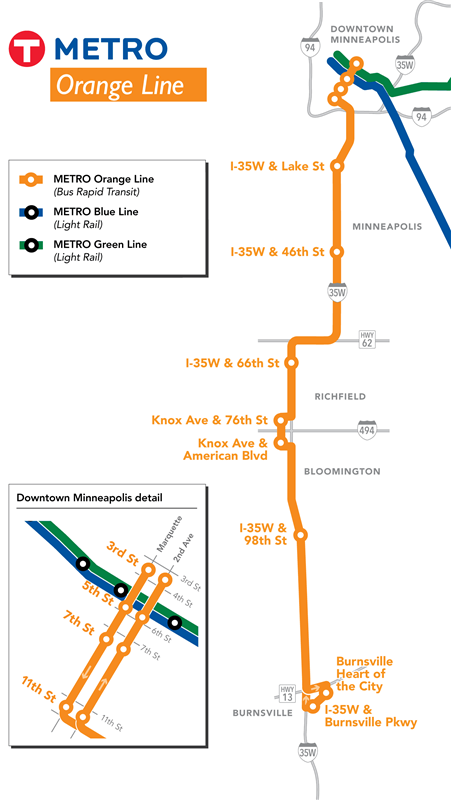 The METRO Orange Line is a 17-mile planned highway Bus Rapid Transit (BRT) line that will connect Minneapolis, Richfield, Bloomington, and Burnsville along I-35W. The Orange Line will provide frequent, all-day service in both directions, seven days a week. This route will upgrade and replace the existing local Route 535 with enhanced service and amenities, and new station features will benefit other transit riders along the I-35W corridor. No changes to existing express bus routes are planned. Orange Line service will have competitive running times for station-to-station trips and offer a new option for reverse-commuters (riders traveling from urban areas to suburban destinations). The project includes street and highway improvements, upgraded transit stations, and improved bus routes. BRT provides high quality, reliable service like light rail transit, but is less expensive to build and allows for a more flexible route. Funding commitments for the Orange Line have been provided by the Counties Transit Improvement Board, the State of Minnesota, the Metropolitan Council, Hennepin County, Dakota County, and the Federal government. The project is currently in the engineering phase. A transit-only access ramp between downtown Minneapolis and I-35W and a new Lake Street Station have completed engineering and are now under construction, led by MnDOT.